TRON LEGACY - the film has been on our minds since the Summer of 2008, when we were given our first of many teasers. By December 2010, expectations could hardly be any higher. Fans of the original film, TRON, from 1982 were joined by those dazzled by the amazing visuals painstakingly dispensed to the public over those two years. In 1982, TRON, took audiences into the inner-world of the computer; one that most folk had hardly any understanding of. Credit has to be given to the visionary writers and directors for producing a film that was visually stunning by the day's standards, but conceptually a bit before it's time. WENDY CARLOS' original score for TRON was only appreciated, like the film, much later than in its original release. 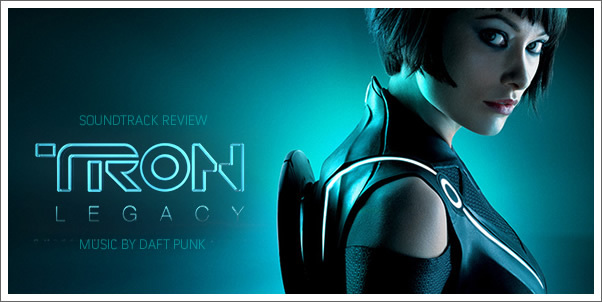 Now, TRON LEGACY returns to that world,...but in 2010 it's a different audience with different expectations. Accompanying first time director, Joseph Kosinski, are first time film-score composers, DAFT PUNK. In the world of electronica and dance music the enigmatic duo reign like mysterious luminaries. Even if you don't think you've heard their music you probably have if you watch any amount of TV; as their music ("Musique", "Around the World", "Harder, Better, Faster, Stronger" and "Technologic") has been utilized in several major commercial campaigns. There was little doubt that Kosinski's design and architectural background would result in a visually stunning film. Similarly, there was little doubt that DAFT PUNK could bring a decidedly modern, electronic edge to the film's score. Even with veteran screenwriters Adam Horowitz and Edward Kitsis (LOST) and the star power of actors Jeff Bridges and Olivia Wilde on-board, the big question still remained. Would all this come together to make for a successful film?